One warm, breezy afternoon in Chennai, as the sun played hide and seek, and the rain clouds threatened to burst, Lakshmi (name changed), in her late 50s, sat upright on a hospital bed, waiting impassively for a familiar sequence of events to follow. In the next few minutes, she was attended to by a doctor, who carefully took out an injection kept in a small, green-coloured icebox. As the contents of the syringe—a colourless fluid—were injected slowly into Lakshmi's lower arm, the fine needle boring into her withered skin, she winced briefly, and then lay down on the bed quietly. Inside the clinical trial ward at the Cancer Institute in Adyar, where India's first dendritic cell vaccine is being tested, women such as Lakshmi are frequent visitors. They receive ten doses of the vaccine—the first four doses are injected once every two weeks, and the rest once in a month. The atmosphere is an unusual mix of hope and despair. The women who visit the ward are suffering from late stage, or locally advanced cervical cancer; their bodies have been slowly taken over by the rapidly spreading cancer cells. At this stage, the invasion of the rogue cells has spread beyond the cervix, and into the pelvic wall. This means that their chances of cure are about 50 per cent. But then, there is some hope, too. The cancer patients in the ward are receiving standard care that includes chemotherapy and radiation. That apart, they are also part of a promising experiment, which, if succeeds, will put India on the global map of cancer research. Dr Nusrat Sanghamitra of CyCa OncoSolutions has devised a nano drilling machine—a protein recombinant—which, she says, holds promise for reducing chemotherapy doses and offers a better quality of life for the patient. 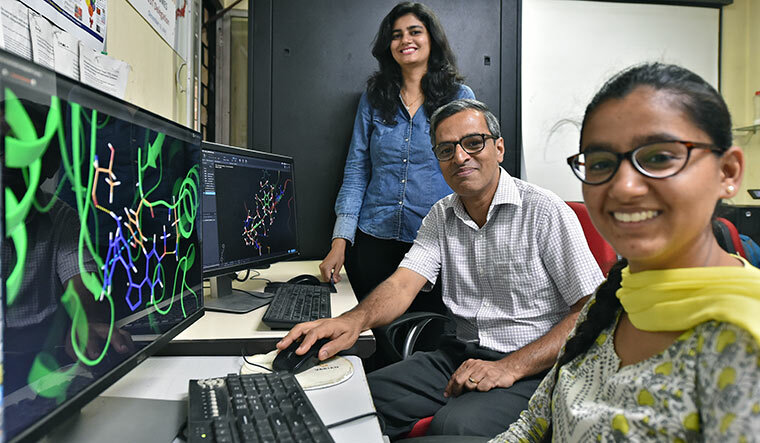 Dr D. Sundar of IIT Delhi and his team are working on studying the anti-cancer activity of two compounds found in ashwagandha—Withaferin-A and Withanone. “We chose late-stage cervical cancer patients because only 50 per cent of those who receive standard care will live. So, to show the benefit of this vaccine, we need such a composition,” says Dr T. Rajkumar, head of molecular oncology and a medical oncologist at the Cancer Institute. So, every few weeks, women such as Lakshmi, who have signed up for these trials, are injected with a “colourless fluid” that, cancer researchers say, will “propel” their immune system to fight cancer cells. “This is not a preventive vaccine, but one with therapeutic properties. We take the patient's own cells, convert them into dendritic cells, prime them with tumour antigens, and then, transfer them back into the patient's body,” says Rajkumar, who is leading the team that is working on the vaccine. Here's how the vaccine works: dendritic cells perform the function of processing antigen material and presenting it on their surface to activate the body's natural soldiers, T-cells. The idea behind administering this vaccine is to get the T-cells going, which will, in turn, finish off the cancer cells. Millions of dendritic cells, prepared in the lab, are injected in a patient's lower arm, from where they are expected to travel up to the lymph nodes and kickstart the immune system. But why wouldn't the body fight off the rogue cells anyway? Because cancer cells are cells from within the body, and because of a mutation, have lost the ability to stop dividing uncontrollably. Our body's immune system has thus been tricked—it sees the cancer cells as its own, and not as foreign bodies that need to be thrown out. In the global war against cancer, researchers from different fields are working on innovative solutions to attack cancer cells. Of them, some are working on prepping up the immune system, others are finding novel proteins and drug delivery mechanisms to target cancer cells, and still others are looking at the anti-cancer properties of plants—all in a bid to offer hope to those suffering from the disease, as well as to minimise side effects of cancer treatments. Dendritic cell therapy is emerging as a more promising way of tackling what Dr Siddhartha Mukherjee calls the “emperor of all maladies”. Globally, several groups are working on dendritic cells, says Rajkumar. But the therapy has been approved by the US Food and Drug Administration only for prostate cancer. If this Indian vaccine for cervical cancer—trials are to go on for the next two years—succeeds, it will be the second to show anti-cancer benefit. The process to make the vaccine, though, is arduous. Dendritic cells are prepared out of monocytes, which are isolated from the patient's blood. The blood is drawn from the patient and filtered through a machine that takes out the monocytes while the rest is routed back into the patient's body. For a patient, it is like being on a transfusion machine. The monocytes obtained are then converted to dendritic cells. The mature dendritic cells are then primed with an antigen (a foreign body that will stimulate the immune system to produce antibodies). For the antigen, Rajkumar is using two options—first is to use proteins from the patient’s own tumour (which was how the phase I clinical trial was done) and the second is to use recombinant SPAG9 (sperm associated antigen 9) protein, for which he has collaborated with Dr Anil Suri, professor of eminence and former director, National Institute of Immunology, Delhi, and his team that discovered SPAG9 in 1998. 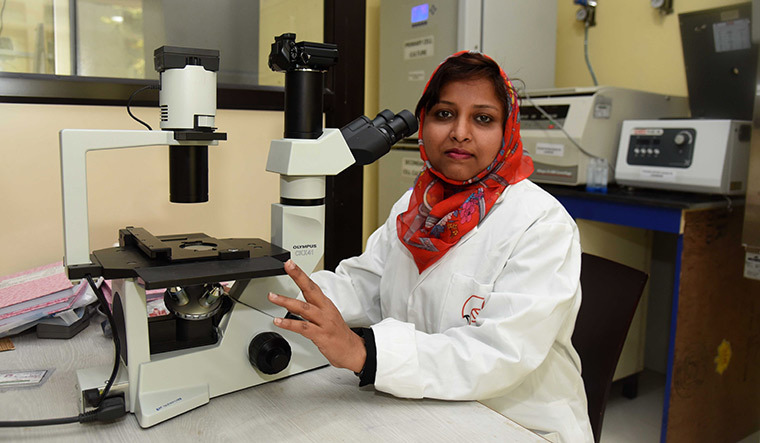 For the past two decades, the Department of Biotechnology has been funding Suri’s cancer research programme, given the urgency to develop new therapeutic strategies for the management and treatment of cervical cancer and other cancers that affect Indians most. SPAG9 is a protein coding gene, which helps in tumour growth and development, says Suri. Cancer cells express several proteins, and by isolating one—SPAG9—that is expressed in several cancers such as cervical cancer, researchers can stimulate the immune system. “The approach that we are taking in these trials is backed by statistics on the incidence of cervical cancer in India,” says Suri. “Every eight minutes, one woman dies of cervical cancer, and all these in advanced stages. At that stage, surgery doesn't work, and the only option is chemotherapy and radiation. Here too, the possibility of cure is 50 per cent. So, the only option for us is to alter their immunological status, so that the person is able to fight the infection himself.” This, he says, is what is referred to as “personalised or precision medicine”, which has the inherent advantage of not being toxic and having no off-target effects. If successful, this will be a true example of Make in India, he says. Drawing the cells, manipulating them to turn them into mature dendritic cells, then infusing them with a tumour protein, and eventually injecting them back into the body is a complex procedure that demands a lot of care. These are cells that have to re-enter the body, so they have to be worked on in a “clean environment”. In Chennai, this is done inside a laboratory with a “1,000-particle” wall—behind the wall, there are less than 1,000 particles in the air, as opposed to the millions that exist in the air we breathe. A scientist can enter only when dressed in an overall suit that covers every inch of their body, except the eyes and the nose. There are special filters installed inside the laboratory where the cells are processed. In the “hoods”, where a scientist sits and processes the cells, the air is sterile. Rajkumar's team tasted success in the first phase of the trial in 2006. These trials were mainly for checking the toxicity of the vaccine. While the vaccine had no toxic effects, one woman among those in the trial, who received dendritic cells primed with her tumour protein, showed no evidence of the disease. “The cancer had spread to her lung when she was injected with the vaccine. Thanks to a great followup system that the hospital has, we learnt that after two years, her cancer had disappeared, and she is [now] disease-free,” he says. Both Rajkumar and Suri are hoping that similar results will be seen again in the next two years—it will take a year for the trial to finish, and another year for following up to check its effect on the women's cancer. Dr Nusrat Sanghamitra says her work is modelled on a targeted approach to attack cells via a molecular drilling machine. Sanghamitra, founder of the cancer startup CyCa OncoSolutions, has devised a nano drilling machine—an engineered protein—which holds promise for reducing chemotherapy doses and offers a better quality of life for the patients. “Cell membranes are semi-permeable. But this protein can cross the cell membrane by a unique drilling mechanism, which can be used to deliver chemotherapy drugs to a patient,” she says. The big problem that she is tackling is the carpet-bombing effect of chemotherapy drugs—the drugs attack cancer cells, but they kill normal cells too. “This targeted approach will help us deliver drugs to precisely the cells that [need it], sparing normal cells, and thus the side-effects associated with chemo,” says Sanghamitra, who filed two patents for her innovation. Sanghamitra, who did her PhD from Indian Institute of Science, Bengaluru, and was one among the President's awardees for the best technology startup this year, says she was inspired to research on cancer because of her father, who was diagnosed with prostate cancer a few years ago. Though he recovered, she says the experience made her focus on finding a way to improve the quality of life for cancer patients. The nano machine, she says, has shown progress in cell lines in the laboratory, and is now going to move on to the animal studies phase soon. She plans to establish a cancer centre in Odisha. 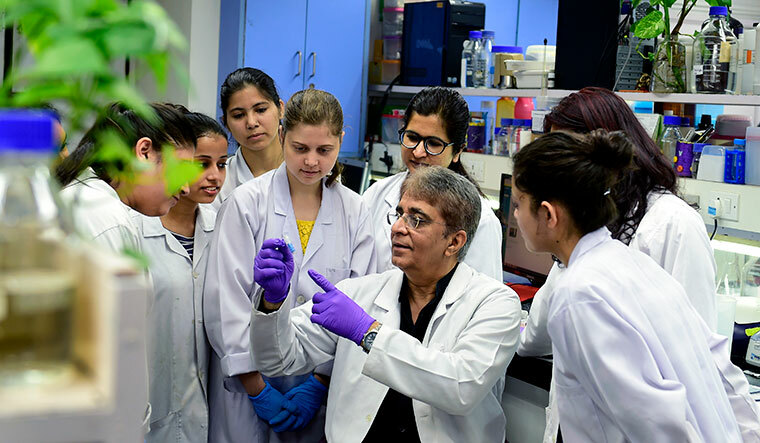 In IIT Delhi, Dr D. Sundar, DuPont Young professor, department of biochemical engineering and biotechnology, and his team are working on studying the anti-cancer activity of two compounds found in ashwagandha— Withaferin-A and Withanone. “That ashwagandha has anti-cancer properties is part of our traditional knowledge system, but its mechanism of action has not been studied,” says Sundar, who has been working on the project for more than a decade now. While Withaferin-A has some toxicity to normal cells, Withanone has no toxicity but less anti-cancer activity. When used in combination though, their effect could be more beneficial. “We are studying the different aspects of these two compounds and their anti-cancer activity. Drugs don't easily get absorbed in the cell membranes, but we have been able to show that Withaferin-A can pierce through the normal cell membrane, while Withanone does not. This demonstrates that Withanone, which has a selective toxicity to cancer cells, is a good candidate for drug development,” he says. For the project, Sundar's team has established a joint international laboratory at IIT Delhi in association with the department of biotechnology, government of India, and National Institute of Advanced Industrial Science and Technology, Japan, and through an exchange of complementary expertise, Sundar’s group is exploring natural products as a viable choice in drug discovery. 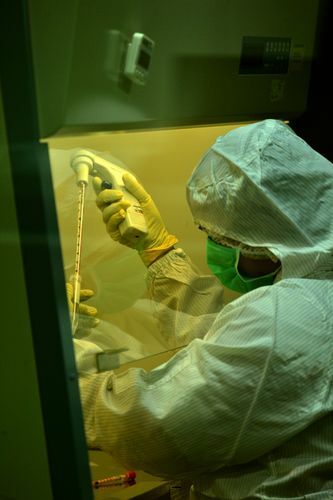 Working on cancer cure, says Sundar, is tricky. “It is like working in a maze or trying to solve a big puzzle,” he says. Making an anti-cancer drug is not about identifying one compound, or identifying one target protein. Different tumours express different proteins (and hence, different targets for attack), and their interaction with these compounds is a complex mechanism that takes years to decode. While Withaferin-A has shown good anti-cancer properties, it can still enter the normal cell membrane. "So,it is still a long way before the plant compounds can be developed as a drug to treat aggressive cancers, he says. Drug discovery is a longwinded process that takes at least two decades before it can enter the market. The complications of finding a way around the puzzle apart, there are several other bottlenecks that scientists encounter. Funding issues, for instance. For Rajkumar and his team, the success of the Phase I trials for the dendritic cell vaccines in 2006 did not translate into funding for the Phase II trials. So from 2007 to 2010, the team had to wait for funds, before the Department of Science and Technology obliged. But the challenges were far from over. In 2013, following a petition in the Supreme Court, all clinical trials were halted, and work on revising the regulations began. “It was in March 2015 that the DCGI (Drug Controller General of India) granted approval for the three-arm dendritic cell vaccine trial,” says Rajkumar. The second phase of the clinical trial started in January 2017. Suri also points to the long-drawn processes of getting a patent—patent legalities can take more than a decade, and consequently, by the time the innovation is patented, a big chunk of the time for which the patent is valid (starting from the year the patent was filed) has elapsed. That process, he says, can be very discouraging for researchers. Both Sundar and Suri point to the need for collaboration, and for various departments—biologists, chemists—to develop innovative solutions. Suri says that SPAG9 is also a biomarker for detecting early-stage cervical cancer, but there is also a need for other partners to come forward for the large-scale validation of the technique. “Hospitals, cancer institutes and other institutions need to come forward for this and allow us to test these innovations. Unless we work together, we cannot develop new solutions,” he says. Suri is right. Because when it comes to cancer, time is running out fast, and the enemy has only been growing stronger.